We’re so lucky to have one of my dearest “party gal” friends swinging by to show us how to make these tasty little treats that are perfect for fall parties! Kori of Paper & Pigtails is quite the designer and stylist. I’m in awe of her creativity and talent on a daily basis. 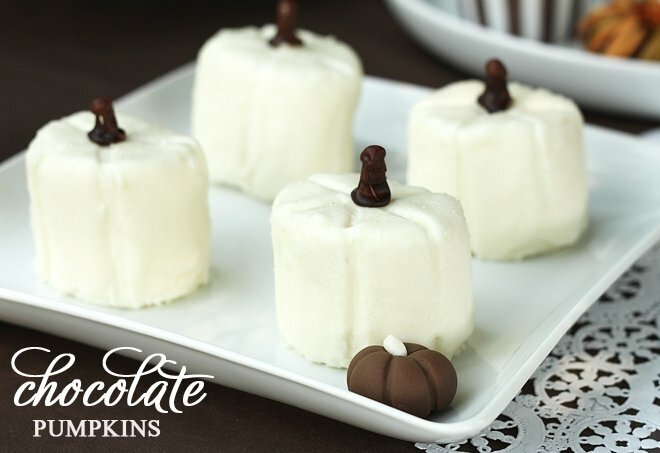 These cute treats are so darling and will definitely be making my Thanksgiving spread. 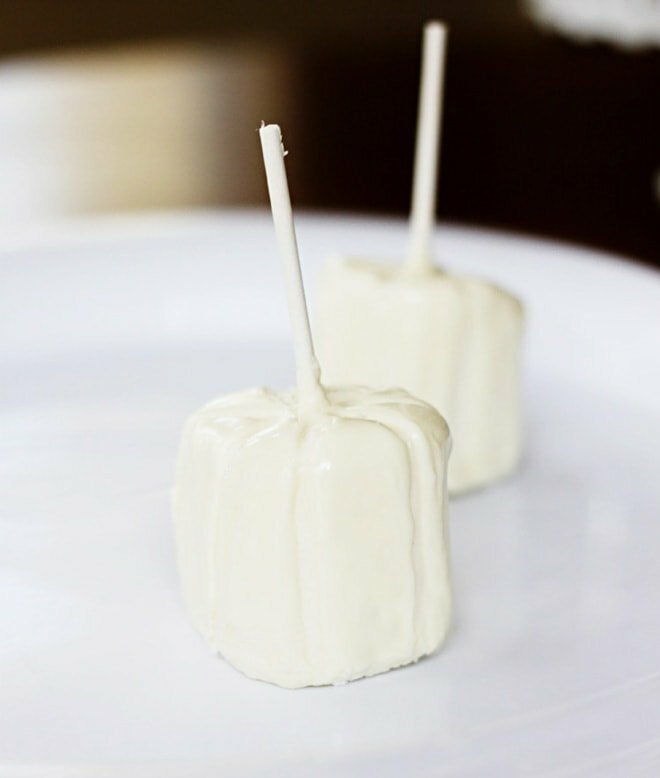 “I made these white pumpkin marshmallows for my monochromatic Thanksgiving table and loved how easy they were to create!” shared Kori. 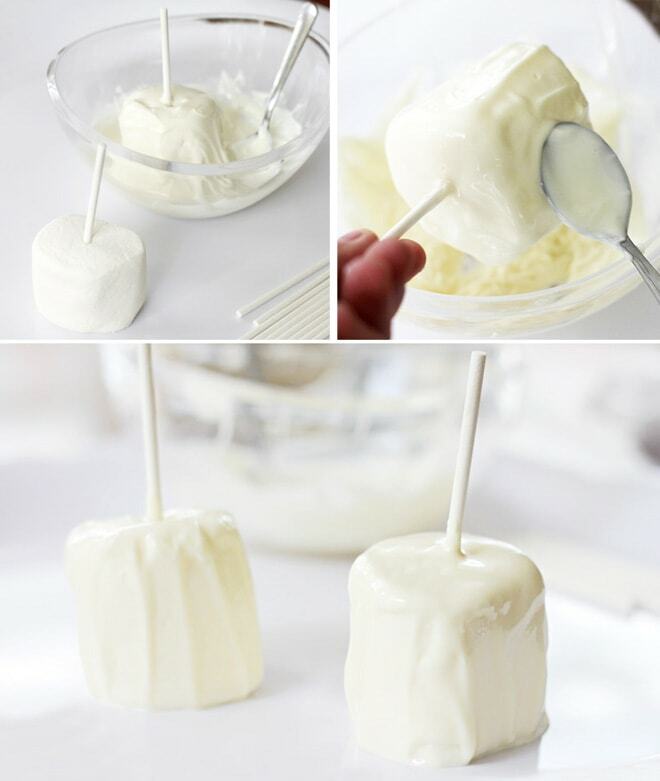 4) once they have been dipped (and allowed to dry just a little bit, use another lollipop stick (or toothpick) to run from the “stem” all the way down the side making indentations around the marshmallow. You will be able to see some of the marshmallow poke through, but it’s fine as it’s all white! Now to add the stems! 6) using the chocolate cookie icing, run the icing up the base of the pop where it meets the marshmallow….continue to do this all around. It will run down a bit, but it’s fine…I think they look more realistic this way! 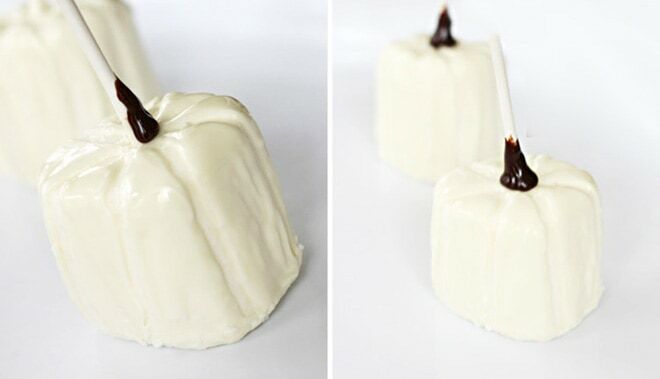 7) cut off the top of the lollipop stick, and place another drop of chocolate icing on top so the lollipop stick is covered completely! 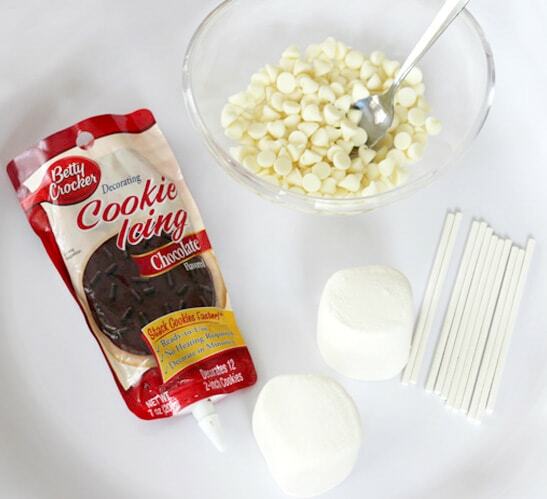 Once the cookie icing dries, you can hold these sweets by the stem to eat…super cute and easy! And for those who like more “bling” , I covered some with clear crystal sprinkles and they were adorable! Adorable! Thanks Kori for swinging by with this sweet tutorial. I can’t wait to add a little bling with sugar crystals to mine and serve them up on turkey day! For more fun party ideas + inspiration, visit Kori’s site, Paper & Pigtails and her etsy shop too! Elegant Thanksgiving Tablescape with Touches of Purple and Gold! Free Fall & Thanksgiving Printables! Adorable!!! I was just thinking of doing white pumpkins just before I saw this!! How funny!! Hi Tanya! That is funny! White pumpkins are oh so cute and a nice break from orange, especially after Halloween! Oh how lovely! I have not had a monochromatic Thanksgiving table presentation yet, ever! I think I will have everything in white this year. A little green with red ornaments and all recipes in white will really be perfect. 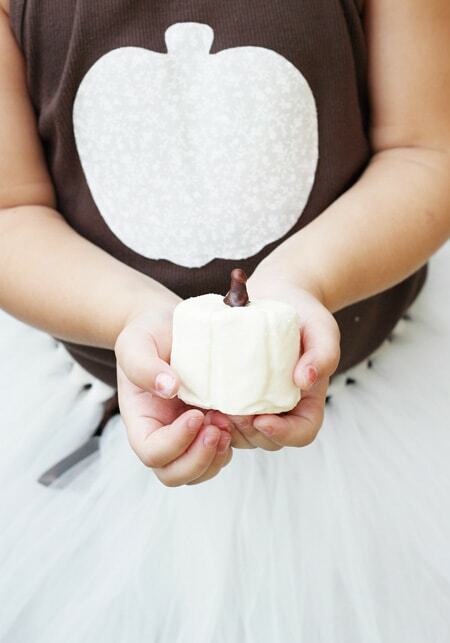 I am so excited to have this marshmallow treat add sweetness in my Thanksgiving dinner menu. Love your post! LOVE these! 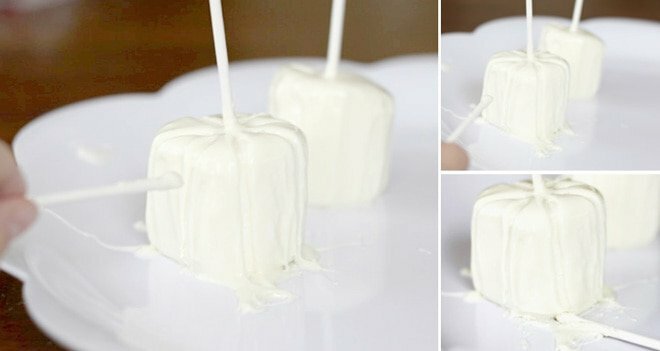 I can’t wait to make these but I am going to switch out the lollipop stick for a pretzel sticks! I came stumbled onto your site from Foodgawker – what a fantastic idea! I am going to try these this weekend as a test run for my Thanksgiving table. Thank you! Can you elaborate a bit about making the stem. Cookie icing? I don’t know what that is, does it get melted? Can be found in a tube. Ready to use icing for cookies. Great stuff. I think it could be dangerous having the popsicle stick cut down and used as the the stem. I would like to use a small pretzel stick and coat that with chocolate so all is edible. Think a child would choke on the stick if adult is not around to warn them.